Which Strike Indicator Should I Use? Question: How do you know what kind of strike indicators to use in a given situation? 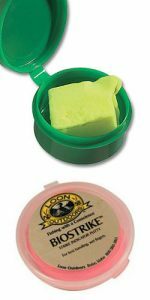 Floating putty indicators like Orvis’s Strike Putty (top) and Loon’s Biostrike (bottom) are popular with anglers who like the size of their indicators to match conditions. Photos courtesy of Orvis and Loon Outdoors. Answer: In most angling situations, a strike indicator has three main duties: 1. stay afloat, 2. be visible, and 3. not spook the fish. You also want it to be sensitive to subtle takes, if you’re working slow water or wary fish. The first time I went out West and saw guys using giant yarn indicators to suspend stonefly nymphs, I was amazed. In most of the places I had fished back east, trout would flee from such a monstrosity floating toward them. But in heavy current, with a heavy fly, you need something of that bulk to stay on the surface. And, of course, Western trout are usually less wary than their Eastern counterparts. Conversely, guys drifting tiny pheasant tails on flatwater sections of spring creeks generally use very small indicators or none at all. 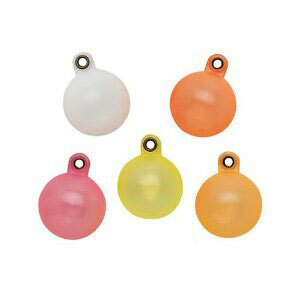 Indicators like the Thingamabobber are impossible to sink and easy to attach and remove. Photo courtesy of Westwater Products. Of course, there’s a lot of personal preference involved, as well. For most angling situations that don’t require a large indicator, I am a fan of floating putty (such as Loon Biostrike or Orvis Strike Putty) because it allows you to tailor the size of the indicator to your needs. Putty comes in several different fluorescent colors, which makes it easy to see in low light, and can be reused. The downside is that it can leave a sticky residue on your line when you remove it. You could also use twist-on or small pegged indicators in most similar situations, if you like. When I’m suspending flies, fishing heavy riffles, or using heavy nymphs, I prefer a fluorescent yarn indicator, and I try to use the smallest one I can get away with. I slather it with floatant to ensure that it stays on the surface and floats straight upright. One of the big advantages of the yarn indicator is that, when it is floating upright, it is extremely sensitive. Before the indicator actually stops, it will tip to one side, giving you a split-second advantage and the ability to detect subtle takes. Again, these are personal preferences. As long as you take into consideration the five factors above when choosing an indicator, the style you choose is up to you.